ProCoat Products, Inc. » Blog Archive Contractors - ProCoat Products, Inc. Independent contractors are just that … independent. They can operate as they see fit, offering services that are unique or not. Those who wish to set themselves apart from the norm are inclined to offer specialty services such as Acoustical Ceiling Restoration. Another opportunity in demand is for a periodic preventative maintenance service call. During each visit, the contractor removes water stains and soot accumulation around air defusers. Depending on the orientation of the contractor, their approach may be different, but the results are the same … greater revenue offering a service with unlimited potential. The client says, “Replace the ceiling.” You say, “I’ll do it if that is what you really want. However, for less than half the cost and a third of the time, I can restore your old one. What we save here, we can apply to the lighting system you wanted but can’t find the money for.” In this one statement you have made the client very happy (you have saved them some money). You have also offered them a system that allows you a greater profit margin per square foot than if you were to replace the tiles with new ones, and you have selected an approach that is much faster to install. You are looking at a project where the specifications call for ceiling tile replacement. You contact the architect and/or property manager and introduce the idea of ceiling restoration … an alternative that does not damage the acoustics or leave the tile stuck to the t-bar system. Or the specifications call for painting of the ceiling utilizing a standard ceiling white latex material. You point out to the architect and/or owner that the material they have specified will reduce the sound absorbing capability of the ceiling, resulting in the noise level going up. When the paint dries, the tile will most likely be stuck to the t-bars and the ceiling will look like it has been painted, not natural like a new tile. When making a sales call you can respond to the need to paint walls and trim with appropriate recommendations. But before leaving, look at the ceiling and if it is not new, ask, “What do you plan to do with this old ceilng?” If they are planning to replace with new tiles, offer to demonstrate the restoration process. You will most likely be the only contractor who makes these points and suggests appropriate state-of-the-art products. By so doing, you will have established yourself as a cut above the norm by jumping the gun on your competitors and establishing yourself as the more informed professional. How often do you fail to get a job because tile replacement is too expensive or time-consuming? In these instances, you have walked away, leaving business on the table. Many ceiling contractors go both ways, providing their customers whatever is most appropriate, either installing a new tile or restoring their old one. One of the objectives of being in business is to generate a profit and ceiling restoration provides an opportunity to do so, at an even a higher rate than earned by installing new tiles. You have just demonstrated the ceiling cleaning process for a potential customer, and they have not been impressed with the results. The age, contamination, and discoloration were more severe than the cleaning product is capable of overcoming. Why lose that job? Why not expand your toolbox of skills to include the application of an acoustical coating? Such a product takes the more challenging projects in stride. And even better, the profit per square foot is greater than with the cleaning process. In order to sell the service, you must be able to discribe it in terms that are easily understood. Ceiling Restoration is not ceiling painting. And to make this clear one must understand the concept itself or you can never relate it to someone else. At no cost, an on-line course can be taken in about one hour’s time. Upon completing the course and passing the test, the basics are understood. Click here to register for the course. The best way to learn all the “tricks” and to gain maximum efficiency is to be trained on the job by a ProCoat professional. In this manner the training is done in a real life situation and the whole crew benefits from the experience. 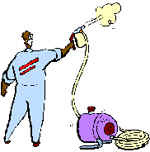 Contractors interested in on-site training should contact ProCoat. Technical information on all of ProCoat’s products is available by simply clicking on the following icon. If you have project-specific questions or require the assistance of a local dealer, ProCoat’s professionals are available by simply calling (781) 767-2270.